In his 1975 book, ‘The Experience of Landscape’, Appleton argued that most people have an “inborn desire” for environments that provide the capacity to observe (prospect) without being seen (refuge). He attributed this urge to early human development especially in the Savannah lands of Africa, where hunter-gatherers had a wide field of view across the grasslands as well as places to hide from danger. It puts forward the idea that human aesthetic experience is based on perceptions that are evolved for survival – places with a clear view provide ‘prospect’ while safe places to hide provide ‘refuge’. Architects, who have taken this on board, design with our well-being in mind. Numerous studies have shown that psychological and emotional well-being is important in our day-to-day management of stress; it is now becoming a universal truth that this affects our performance both at home and at work. 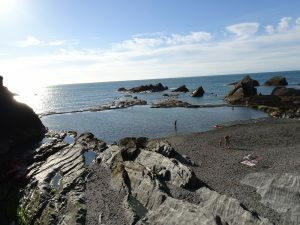 How is this research relevant for Acoustic Hubs? We are not just about providing a product that is aesthetically pleasing or acoustically superior (although these are both very important, and we tick those boxes too! ), we are also about creating a space which helps to diminish stress. The evidence that our environment affects our mental health and performance is irrefutable: Paul farmer, CEO of MIND, has said, “Dilbert-type cubicles won’t cut it in the information economy. To maximise productivity and creativity, it’s crucial that staff have inspiring, flexible working environments. Everyone thinks of health and safety as a physical thing – we mustn’t forget health and safety for our minds.” It is true to say that due to the way in which we now work, in a fast-paced, highly pressurised and constantly changing world, the need for a ‘refuge’ which still provides ‘prospect’ is increasingly important. 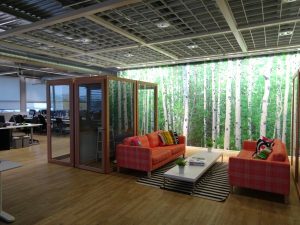 The laminated, glazed panels of the Acoustic Hub provide the ‘prospect’, the view over the entire workspace, while the fabric covered acoustic panels inside provide the ‘refuge’, a place to work or meet in peace and quiet. ‘Prospect’ – the smooth, laminated glass panels of the Hub are 12.8mm (dB39) thick for superior acoustic performance, and sit tightly within the main frame. Glazing on two sides gives a clear view of the surrounding environment. 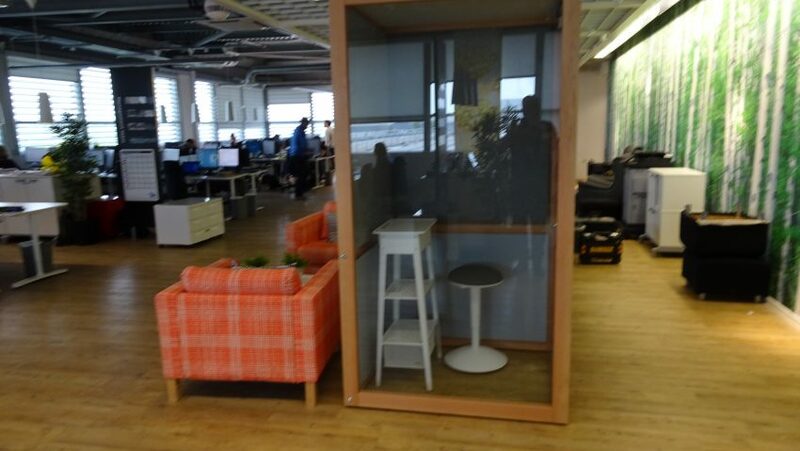 ‘Refuge’ – a kiln-dried Douglas Fir frame creates a solid base upon which birch ply panels can sit securely with acoustic absorber infills by Quietspace (NRC 1.0) creating a sound absorbing refuge in which to work. Further ‘refuge’ can be created by the use of blinds or curtains if more privacy is required, and the 25mm Quietspace tiles (NRC 0.85) in the ceiling also absorb sound, while an acoustic tunnel creates natural ventilation. 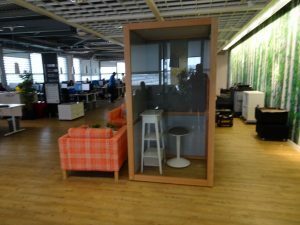 The images below show hubs at IKEA head office – good examples of quiet work spaces which provide ‘refuge’ with ‘prospect’.